I was working on this post last night and during my last review our internet decided to start acting up so I was not able to publish it. Oh well, tonight it is then. 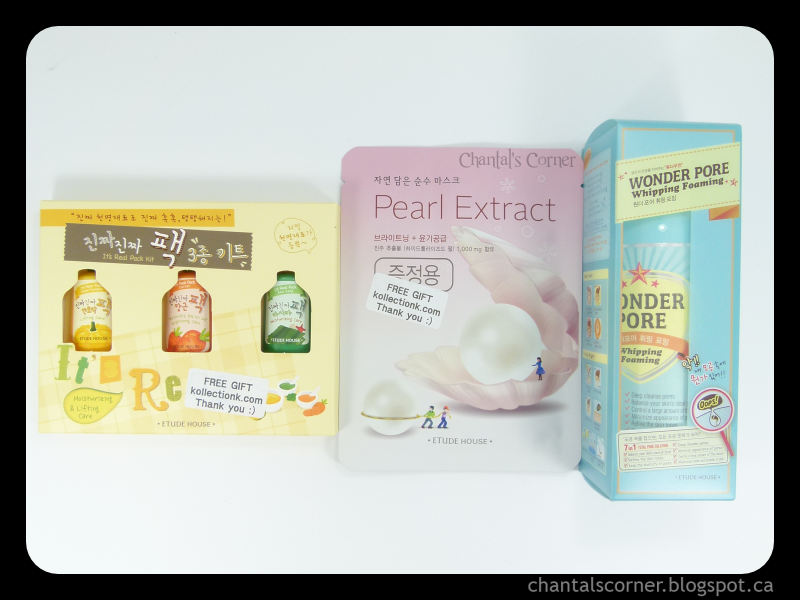 A few weeks ago KollectionK had a promo that if you purchased the Etude House Wonder Pore Whipping Foaming Cleanser you got a free Etude House I Need You! Face Mask Sheet. I was planning on buying that exact cleanser to try after I’m done the ones I currently have, and I love those face mask sheets so I figured, why not buy it now? Etude House Is It Real Pack Sampler (freebie/$??) – Facial massage pack formulated with real natural ingredients for your healthy skin. Etude House I Need You Pearl! Face Mask Sheet (freebie/$1.79) – Those essence mask sheets contain fresh food extracts for healthy skin care. Tension fit design for improved facial adhesion and comfort. UPDATE: Read my review on this face mask sheet. Etude House Wonder Pore Whipping Foaming Cleanser ($17.60) – The Etude House Wonder Pore Whipping Foam is a facial cleanser that can also double as a mask. To apply, just slather it all over your skin and then massage it where your pores are most blocked. You can also use this special brush that comes with the set (awesome stuff!) to really deep clean your skin. UPDATE: Read my review on this Whipping Foaming Cleanser. Etude House also came out recently with nail care products so I just could not resist grabbing a few of those as well! And how cute are those nail face designs? Tee-hee! Etude House Help My Finger Art Gel Coat ($4.79) – This is a gel top coat that gives your nails an ultra glossy and voluminous finish, with upgraded adhesive strength allowing you to easily attach nail stones or arts without the use of nail glue. I was thinking this might work well over glitter polishes. UPDATE: Read my review on this Art Gel Coat. Etude House Help My Finger Essence Spa ($4.99) – Containing seaweed oil extracts. Treatments the damaged cuticles and give nutrients to around nails. Etude House Help My Finger Treatment Nail Salve ($5.19) – This gel-type treatment is an enriched complex of moisture-rich ingredients that supply essential nutrients to hydrate, condition and restore flexibility to dry nails and cuticles. Etude House Help My Finger Sunshine Whitener Nail Base Coat ($6.99) – This treatment naturally covers nail imperfections, keeping nails fresh, radiant, and incredibly healthy-looking. I’m curious to see how this will do with the yellowing of nails. Shipping for this order came to $4.99, how awesome is that?!? And there you have it, my latest online order from KollectionK.com*! * This is my affiliate link.